Terrebonne Expo Centre provides between 40,000 to 80,000 sq. ft. column-free exhibition halls with 40 ft. high ceilings. With 80,000 sq. ft. of surface area, we are able to welcome 2 500 seated guests for a banquet or a corporate event or up to 400 booths. The room is divisible into 40,000, 60,000 or 80,000 sq. ft. halls to suit your needs. 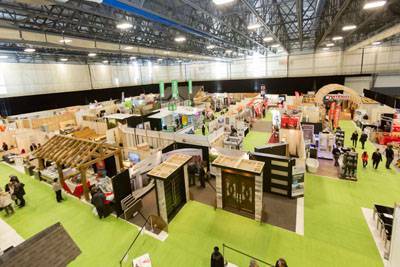 With 1,000 free parking spaces, our facilities are easily accessible, and will meet all you event-related needs; exhibitions shows, Trade Shows, corporate parties, conferences and any other type of large-scale events. Loading Dock: Yes, we have a loading dock at ground level available for storage, assembly and disassembly of your event. Number of parkings: 1000 free parking spaces. Disabled access: Yes, lift is accessible on the ground floor. Ticketing Service: Yes, a space reserved for the ticket is located in the lobby. Scene: (no exclusivity) The Terrebonne Expo Centre works with trusted partners and you can use their services. However, you are free to work with partners who you trust. Audiovisual Service: (no exclusivity) The Terrebonne Expo Centre works with trusted partners and you can use their services. However, you are free to work with partners who you trust.